THERE'S nothing Judy Crabtree enjoys more than getting her needle and thread out for a good cause, but a new project is touching hearts around town, including her own. Although she now has two strapping grown-up sons, Mrs Crabtree lost her three-month-old daughter Karen to German measles. "There are so many help groups these days, but there was nothing for us back then," she said. "We were told to move on. It's not easy and it stays with you forever." But Mrs Crabtree has been sewing angel gowns for babies - between 20 weeks gestation to 12 months old - who have grown their wings. "I really think if we're helping one family get over the loss of a little one we're achieving something," she said. "This is close to my heart." 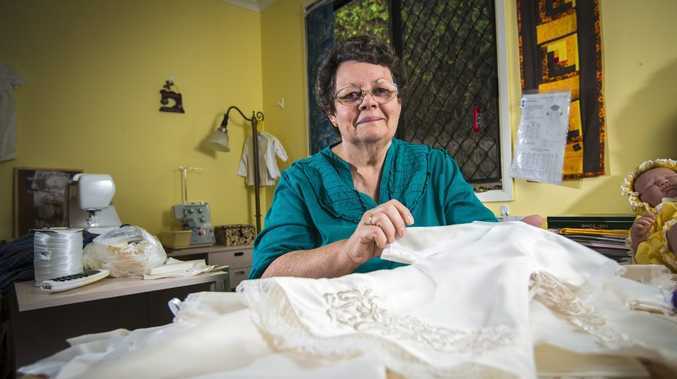 Angel Gowns for Angel Babies: Gladstone seamstress Judy Crabtree talks about why she sews baby gowns from donated wedding dresses. Mrs Crabtree said 50 Gladstone women had so far donated their wedding dresses, which were then reconstructed into gowns. About six babies die a week, and one dress can make up to 20 little gowns. "I try to fussy cut it to get the best out of it," she said, adding that she could spend up to 10 hours a day in her sewing room. "We seem to have the most need in Queensland." The group is always after dresses, haberdashery shop vouchers and postage-paid 5kg bags. Find out how you can donate at the website of Angel Gowns for Australian Angel Babies, www.angelgowns.org.au.